Jaime Stein represents a new breed of non-profit campaign contributors – one whose efforts can be easily hidden by traditional fundraising measurements. @JaimeStein is deeply involved in #Climb4Cord; a fundraising event where a select group of executives climb Mount Kilimanjaro to raise funds for the Canadian Blood Services ambitious project to raise funds for a national public umbilical cord blood bank. This event just happened in August 2013 and the whole team raised an impressive $350K. I first became aware of @JaimeStein ‘s efforts – as he announced his 6 – 8 month long training program and invited friends to sign up in a Google Calendar for one of his weekly training hikes in Toronto #KiliHikeTO. I had the pleasure of walking with @JaimeStein on April 11 <- his blog captures this. I count Jaime among the new breed of social wunderkind – who are as active outside of their emploi as they are inside it. Folks who expertly leverage social media or technology partnership to advance their personal ambitions ( like the impressive @sneiditee @hessiejones @mmonaa @helenandrolia @natandmarie or @greenwooddavis ). Among his many efforts, Jaime participated in #BeerHikeTO evenings with friends, secured awareness, commitment and generous donation from ING Direct and worked with good folks from Roadpost to secure satellite technology ( DeLorme inReach satellite communicators) to test and send progress of his trek back through social media channels. [Jaime’s blog post on the very cool technology here]. He no doubt contributed to the over 3100 mentions on twitter, 27 blog posts and over 192 news articles covering the climb. [sysomos for #climb4cord, #beerhikeTO, #kilihikeTO in the last 12 months]. The folks tweet sharing Jaime’s climb messages included some great Canadian twitspokespeople – the @CEO_INGDIRECT, @DaveoHoots, @CTVCanadaAM, Erica @YummyMummyClub. But in reviewing the donation website, I was stuck that Jaime’s other efforts were not affecting his ‘rank’ as a fundraiser – and yet – by blogging, running Twitter events, inviting Canadians to joining his personal training – he was likely creating far more impact than revenue. Most fundraising goals are clearly expressed in dollars — and yet, for a non-profit that also relies on generating awareness of a new cord blood bank and encouraging personal cord (and blood) donations, non-revenue metrics must be valued as much as generating revenue. I’m certain Jaime’s efforts are not lost on Canadian Blood Services – they have come across influence marketing in its truest form. Jaime is personally connected to the cause and happens to be a brilliant marketer (in social and otherwise). It may just be the website and measurement had not yet caught up to fundraiser like Jaime. Yet, I am left wondering if there are other non-profits who have yet to measure efforts like Jaime’s – who is ushering in new levels campaign contribution. This entry was posted in analytics, influence, metrics, social networks and tagged #climb4cord, #kilihikeTO, 2013, Canadian Blood Services, Case Study, fundraising, Influence marketing, influencer, Jaime Stein, Kilimanjaro, Mount, Mt, non-profit, social fundraising, social media on September 5, 2013 by Laurie Dillon Schalk. The Boston marathon explosions came as a real shock yesterday evening. Much like many of my social colleagues, I want to write about my thoughts but still I feel quite private and emotional about the loss of life, the terror and the scare. So I acknowledge this, and choose to keep these feelings to family, friends and Facebook and so purposefully write on another tangent – that is valuable business take-aways. Quite soon after news of the Boston Marathon 2013 explosions emerged, @unmarketing tweeted “if you have scheduled brand tweets today, turn them off”. That hit home for me – as I’m fortunate enough to be deeply involved in a number of brands’ social strategies and community management thereof. Admittedly, having produced several very detailed brand playbooks on social management (with sections on guidelines on community management postings & post escalations), I have completely overlooked the idea of including a section on ‘disaster response’. I actually took the @unmarketing tweet and forwarded it to my staff & clients – recommending strong consideration of a quiet approach. Stopping any scheduled tweeting is very important as it becomes very evident to the rest of us who is scheduling – which indicates both brand broadcasting and insensitivity to near world events. His message resonated with many people with 548 retweets and 130 favorites since yesterday. And so ‘shut up’.. don’t hijack by using an incident as a way to push a marketing message. 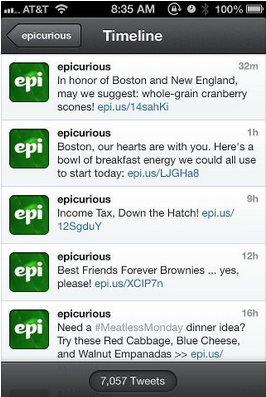 Lindsay Bell @belllindsay posted on Facebook another catch by @unmarketing (no flies on him) with Epicurious promoting scones and breakfast recipes around messages of consolidation. In the amazing commentary that followed from her Facebook friends, one especially caught my eye. The comment read that brands should ‘sit down and shut up’ then ‘figure out how you can really help”. Responding in a meaningful way means delivering something that helps the situation at hand. Google is terrific example of large scale immediate response as they relaunched their Google person finder tool. These disasters are not times to push any kind of marketing agenda forward. If there is no meaningful contribution to help the situation, then acknowledge the situation and then go quiet. Disasters are sensitive situations and certainly not worth capitalizing on nor moving on too quickly to ‘back to business’ commentary, in my opinion. This was posted early this morning, before the above ‘sit down and shut up’ comments. There is nothing worthwhile to say when our hearts and minds are elsewhere. As it turned out, that tweet resonated with the agency’s followers – getting favorited and re-tweeted quite often. Gaining a response, however, was not the reason for the tweet. It was a human response to having nothing to contribute. The account was silent for the rest of the day. Finally, in a disaster, don’t share the graphic images on Twitter and Facebook. One of the first tweets I saw of the 2013 Boston Marathon was of an accident scene with a lot of red on the ground. It took me a few minutes and more reading to figure out that I was looking at a disaster zone. I doubled back in my tweet stream to make sure that I didn’t re-tweet any images that were graphic. Fortunately I did not. What I didn’t like was the sharing of graphic images across Twitter and Facebook. Indeed some of Facebook friends admitted to unfriending on Facebook for anyone sharing graphic images. Many brands would not be sharing imagery of a disaster but news publications do. They put disclaimers of ‘ warning the images that follow are graphic’ – however, I feel quite strongly some images just should not be shared. I’m still personally mulling over the Boston Marathon disaster and will continue to think of those impacted for days to come. Still, it helps me to just write about some valuable lessons for brands in how they react in a real world, near world event – if anything, as a distraction. I welcome your comments and observations (please add your @ handle). Thanks. This entry was posted in Crowd Wisdom, digital strategy, influence, share, strategy, twitter and tagged 2013, @unmarketing, Boston Marathon, brands, community management, disaster, how to respond to a disaster in social, lessons in social media response, science of sharing, sharing, social media, social networks on April 17, 2013 by Laurie Dillon Schalk.